Safety Pair Double Wall Exch. Like all Polaris Plate Heat Exchangers, our plate-and-frame exchangers deliver economical operation, low maintenance/repair costs and long service life. In any application, the Polaris Flex system provides the most economical, efficient plate heat exchanger design. Multiple plate sizes are available for each connection size. 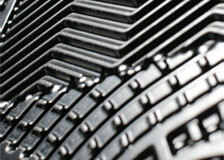 Plate patterns are correctly suited to custom applications. You’ll find exactly the plate configuration you need. Correct plate geometry, patterns, and connections with the Flex system enable us to customize ideal designs for HVAC, chemical processing, food processing, oil and gas refining, and many other uses. Flex can end the need for multi-pass designs. All connections can be located in front - you’ll open or close your Polaris unit for maintenance, repair, or expansion without disturbing the piping. The Polaris Flex System: your key to high-efficiency heat transfer. During critical tightening operations, a patented locking lip at the hanger and guide sections of each Polaris plate draws plates securely together. The Plate-Lock System closely aligns plates and gaskets, and keeps Polaris units tightly sealed even at high working temperatures. Advanced glue-free systems for gasketing Polaris plate-and-frame heat exchangers. Clip-Tite gasketing from Polaris combines economy, positive fluid separation, economy, and easy use. It’s perfect for most applications. Integrated gasket clips fasten securely to the plate. And because Clip-Tite gaskets can be fastened without tools, they’re simple to replace. For applications with food or special sanitary requirements, choose glueless Polaris Press-Tite gaskets. For more information, e-mail us or call 732-544-8800.